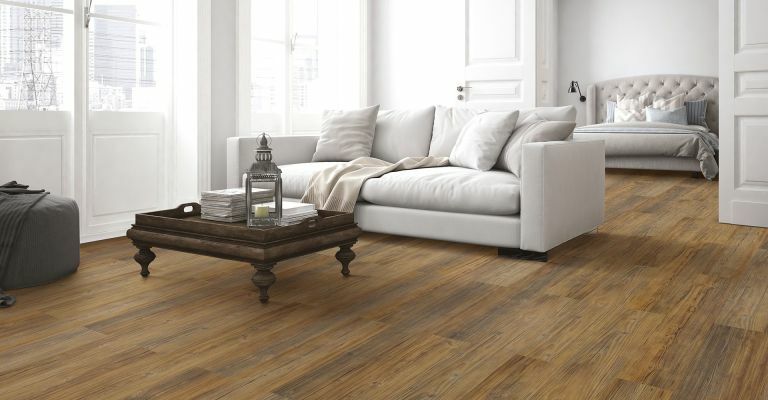 When it comes to choosing the right flooring for your home you have to consider many things. How often do you use the room? Will it be exposed to a lot of sunlight? Is it a wet room such as a kitchen or a bathroom? In this guide flooring experts BRICOFLOR help you to choose the best fit for each room. The place where all the family gathers is the living room. Highly frequented and often with a large window, a durable flooring with protection against UV is generally the best option. In this case we recommend vinyl flooring – the perfect combination of resilient materials and easy maintenance that doesn’t cost the Earth. In fact, vinyl flooring is perfect for every area of the house including wetrooms and hallways. A chic and modern flooring that makes it simple to change the tone of a room if you get bored by simply adding a rug! These areas are prone to splashes and spillages therefore water resistance should be taken into consideration when choosing a suitable flooring. Whilst ceramic tiles are a classic option in terms of moisture repellence, they are also the worst ranking flooring for heat retention, so unless you are living on the Costa del Sol you might want to consider laminate or vinyl flooring. These floorings have a much better rating when it comes to heat retention and are still water resistant. In the bedroom, carpet is a luxurious treat for the feet, being both soft and having great heat retention. Not only this, but carpets improve the air quality of a room as they act as a filter for the dust particles. These are then cleansed when vacuuming your room, which need only be done once per week, as the foot traffic is usually low. The main thing to consider in terms of technical features when choosing flooring for your home office is the castor chair suitability. Carpet tiles are an extremely durable option that are often used in offices and are still very pleasing on the eye. These also mitigate the cost of hiring a professional carpet layer as they are super easy to install and you can play with making patterns. The sound absorption quality for this option is optimal so you can work in peace and quiet. Garages are in need of some heavy-duty flooring that can handle the weight of a car. You should also consider the dirt that can come in from the tyres, so something that is easy to clean is the best choice. You can actually get interlocking PVC tiles that are easy to clip together and take apart made with garages in mind. The smart option for the children’s bedrooms and even guest bedrooms would be organic flooring. The new bio-flooring trend promotes flooring such as linoleum flooring which is not only natural but has great sound and impact absorption. Perfect for when the little tykes are playing and making a racket! The alternative would be hypo-allergenic carpets that are soft, warm and gentle for those sensitive to allergens. For high quality European flooring brands discover the BRICOFLOR Online shop today. Your flooring and wall experts.